I noticed more things from looking at those than I did from watching it like, what? 3-4 times? Loving the circuit board material in pic 30 in the arch! Ta, this is very helpful. In my opinion, I think it's safe to say that when the planet and moon turn red, it's because Mm's pop-it is red...? And I haven't paid too much attention, but would that be the same with the grappling hook too? I love speculating over this game. Awesome! These pics are awesome! I wasn't all that excited about this until I just watched the trailer. WOOHOOOO! There seems to be a texture-shifting/moving material. Check it out at 1:15. Maybe if it can be customized, it might make for some good liquid-flowing textures. I definitely want to see free-flowing water though.... Hmmmmmmmmmmmmmmmm. Also wondering if the TV-like screens at 1:11 are the custom-video stuff you can do? That definitely looks like 8-bit Rad Racer for the NES. There's also more of that texture-shifting material in the background as well. Other note, are they going with a 6-star system now (at 1:00)? That 3D pop-out at 1:39 is fantastic. I hope we get to mix and match poppit colors and that decides the color of things. 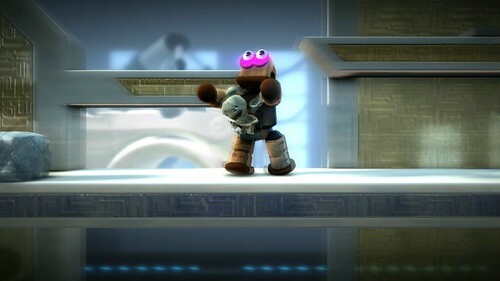 I didn't like any of the colors combos offered in LBP. This looks awesome! so many new features. I'm glad they're emphasizing on the LBP1 compatibility. thanks for the frame by frame breakdown. At this part, did anyone notice how on the sides of the screen, there appears to be television screens with actual TV playing? Is this the background or something for the arcade part? Now I have to be thinking about Little Big Planet non-stop for seven month maybe more! I can't wait for Winter 2010! I think the TV's are racer minigames!!! I just noticed something amazing about the techy background in that trailer!!! It moves! The robotic arms move around and do stuff! I wonder what other moving backgrounds there will be? At this part and some others you can see stuff moving in the background. Not only is layer shifting of objects possible, but it seems that it may not even need a logic solution. You may be able to simply change the direction of gravity (could that be what the gravity tweak does?) to go into the screen rather than toward the bottom of the screen, and have objects (such as race cars) roll right up and down ramps. I wonder how flexible the gravity will be. Perhaps it could go into the screen AND down: that would be perfect for pinball levels. 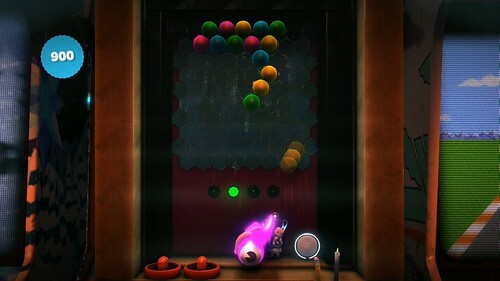 I think I'm gonna' put my pinball level on hold until lbp2 comes out. At 1:35 the light appears to be following sackboy. Anyone else agree?